This study covers the first sixteen chapters of the Gospel of Matthew and will be the first of a two-part series written by Dr. Jack Scott, former writer for CE&P. The text is part of a 26-volume study of the Bible. Susan Hunt, writer-consultant for CEP, and Lynn Brookside have developed both a student book and a leader's guide and adapted it to the WIC emphasis on understanding the Bible from a covenantal perspective. 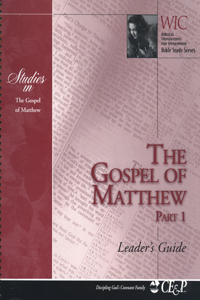 Leaders Packet contains: Matthew student book Matthew Leaders Guide ABES commentary by Jack Scott on Matt. 1-16.